WILSON, Charles, a Representative from Texas; born in Trinity, Trinity County, Tex., June 1, 1933; attended the public schools; graduated from Trinity High School, 1951; while a student at Sam Houston State University at Huntsville, Tex., was appointed to the United States Naval Academy and received a B.S. 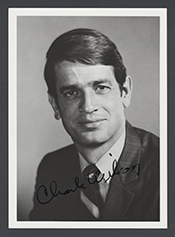 from the Academy in 1956; served in the United States Navy, with rank of lieutenant, 1956-1960; engaged in the lumber business; elected to the Texas house of representatives, 1960-1966; elected to the Texas senate, 1966-1972; elected as a Democrat to the Ninety-third and to the eleven succeeding Congresses (January 3, 1973-January 3, 1997); was not a candidate for reelection to the One Hundred Fifth Congress and resigned October 8, 1996: died on February, 10, 2010, in Lufkin, Tex. ; interment in Arlington National Cemetery, Arlington, Va.
Papers: 1960-1996, approximately 681 linear feet. The papers contain the congressional records of Charles Wilson, and include correspondence, invitations, questionnaires, press releases, newsletters, audio and video tapes, photographs, scrapbooks, and his voting record. A finding aid is available in the repository and online. Oral History: 1972, 32 leaves. An interview of Charles Wilson conducted by James W. Riddlesperger on January 4, 1972 for the Texas Political History Oral History Project. In the interview, Wilson shares his general views concerning the problems in the Texas state government. He also talks about personal legislation, utilities regulation, the appointment of committee members, lobbies, campaign financial disclosure, election filing fees, committee structure, annual legislative sessions, taxation, and legislative apportionment. This oral history is currently closed and unavailable for use. For further information about this transcript, please contact the University Archivist. Crile, George. Charlie Wilson's War: The Extraordinary Story of the Largest Covert Operation in History. New York: Atlantic Monthly Press, 2003.